You’ll start to notice a pattern in these posts. I confess I didn’t leave my house for much the first few years after the twins were born, it was just too chaotic to do by myself. So, I had to get a little creative and figure out ways to streamline my community service without really leaving my house. I held a lot of drives in my home and delivered to one outside location. This made it much easier for me, we met the needs of people in our community and my toddlers could help right alongside of me. Volunteering your home as a collection site for warm clothes is super easy. Start by contacting a local agency that you know is collecting items and arrange for a drop off date. Decide if you want to collect for one day, or collect over a longer time frame. Send out an email, text or Facebook event asking friends and family to bring their gently used/like new winter coats, hats, gloves, mittens, scarves, snow boots and snow suites they are willing to donate. Put out a collection box and have everyone drop their items inside. That’s it! Once you have collected from your last volunteer you are ready to deliver the items on the scheduled drop off date! Our coat collection during the girls’ 4th birthday party. If you are not aware of any coat drives happening near you, you can contact your local department of social services and ask if they are collecting donations. 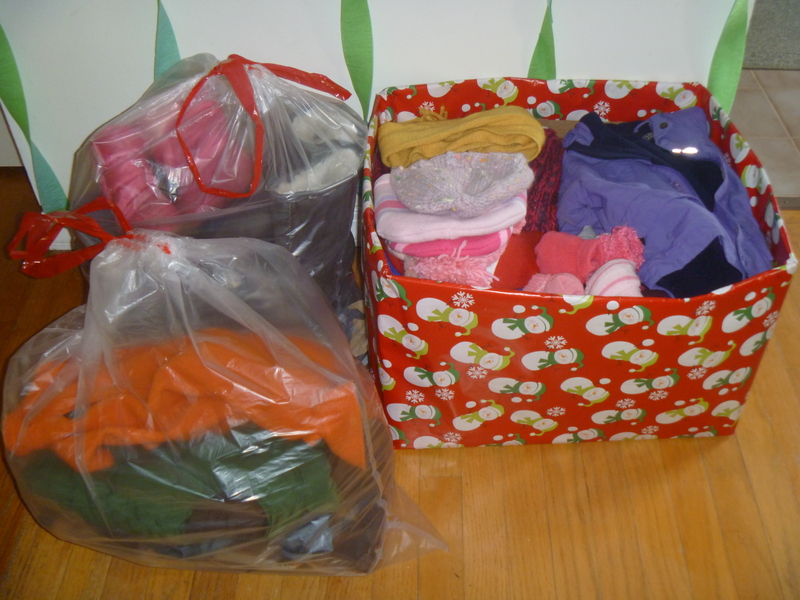 Very often they collect for children in foster care who do not have enough winter wear. Most often children taken into foster care leave their homes in a hurry and there may not be enough time, or funds, to secure a coat or boots quick enough. Your donations will help fill that gap for them. If you are feeling especially festive you can host a drive for an hour or two and put out some cookies and cocoa, or eggnog. (After all ’tis the season to celebrate!). Be sure to send a follow up thank you to everyone who donated. An email or Facebook update with a photo of you and the kids dropping off items makes for an excellent digital thank you card. First of all I love your header photo. It is too cute with all the moms in the background. Second thank you for this idea. I have been looking for opportunities to volunteer this holiday and this is an excellent idea. I think this is fantastic we always donate to charity especially at this time of year where many cannot afford basic costs never mind presents and it is truly sad. This is a great idea, everyone has extra clothing lying around! Oye the amount of clothing you have to wrangle along with the kids in the winter. Makes me exhausted just thinking about it. lol I only invite people I know, but it brings all the items to me and then I only have to leave once to drop off. Much easier! 🙂 Plus the kids help with sorting and see and hear what’s happening. This is a great idea! I love to go through our clothes and toys this time of year to give as much as we can to charity. It is so rewarding knowing that we can help others in this way. What an amazing thing to do. A coat drive sounds like a great idea. Wow, now that’s a fantastic idea, to host the drive in your own home. I’m sure organizations would appreciate that, and your friends would like to visit with you when they drop off various items. I’ll have to talk to my hubby and see if we can work this into our calendar. The great part is these kinds of drives work right into parties you may already be hosting. 🙂 People are already coming to your house. It’s amazing how much people enjoy being able to donate. I’m a firm believer in “every little helps” This isn’t a little thing at all, so I’m sure it will help A LOT. Great article. We tend to donate all our old clothes to different areas in need. I receive flyers and if I have a bag of clothes sitting around, I give them a call to come and collect. I have a friend that hosts Holiday Open House every year and asks her friends to ring a warm coat to donate i they can. It is a great way to remind us to grab a coat to donate, stop by and visit, and have a warm cup of cider! Now that’s really smart–hosting a collection at home and turning it into a little party, too! I have a stack of clothes I recently cleaned out of my closet, waiting to go to a better home, but I didn’t think to look through our coats in the hall closet. Now I will! It’s definitely add good reminder to go through all the stuff from past years and make sure there’s year for the new things that are going to be coming in this year. I agree with a few of the other commenters he said that they’re going to be cleaning out things. I love your approach to decluttering and focusing more on people this time of year. It’s definitely a good reminder to go through all the stuff from past years and make sure there’s room for the new things we can’t wait to open on Christmas day. I agree with a few of the other commenters that said they’re going to be cleaning out things from closets. I love your approach to decluttering and focusing more on people this time of year. We have a local coat drive near us ever winter and we try to contribute when we can. We also try to donate toys and any winter clothes and boots our children have outgrown at this time of year because there always are families in need. 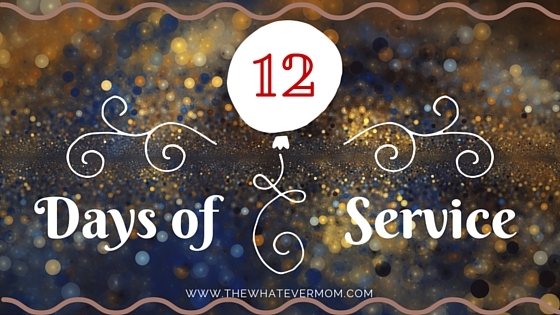 I love that you are doing this 12 Days of Service. What a beautiful idea. Our local grocery store used to do a coat drive, and now that I think about it – I haven’t seen one done in a long while. I think the stores and other areas have been concentrating on food drives lately. We love participating in coat drives. I even make my job participate for a local charity!